When it comes to creating the subtle taste of Kyros Kebab, we know better than all the rest. You will find all flavours come together on one refined quiver of kebab yummy from the first bite. WHAT MAKES KYROS KEBAB SO SPECIAL? All of our kebabs are made fresh-to-order and grilled to perfection. Only freshly meat cooked which are marinated with special spices and ingredients are served for you. Our kebab meats are roasted over a specially made, stainless steel, rotating infrared vertical burner that allows excess oil to drip off. This makes our kebab meat beautifully roasted, yet lean and low in fat and cholesterol. 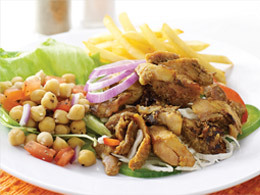 Served with a generous portion of fresh salad, you can now enjoy a healthy yet delicious kebab meal! Savour our sweet and tangy special sauce that brings out the fabulous flavours of Kyros’ kebab. 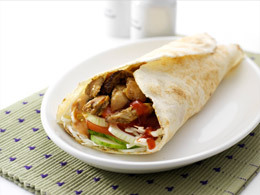 We have a great selection of wraps...... CHICKEN, BEEF, LAMB, JUMBO CHICKEN SAUSAGE, CHICKEN TANDOORI and even a VEGGIE WRAP for the vegetarians! Our mix of Mediterranean and Western concepts in our stores reverberate an ambience unlike any other. We are committed towards providing safe and quality products to our customers. Our kebabs which are processed in our factory follows strictly the Hazard Analysis and Critical Control Point (HACCP) system and are certified Halal by JAKIM.